The first part of this series is here, and the second part is here. House rabbits eat three things: hay, rabbit pellets and fresh fruits and veggies. Let's look at them one at a time. Hay - Rabbits need plenty of fresh hay to stay healthy, it provides much needed roughage. Timothy hay is best, and should always be given instead of alfalfa. I'm starting to sound like a broken record about this, but your local rabbit rescue will be the best source for hay and pellets. You can buy hay at the pet store, but it'll be expensive and you have no idea how long it's been sitting on the shelf or in the warehouse before you bought it. We get a great deal from our local source, paying a dollar a pound for fresh hay. Pellets - this concentrated food provides essential vitamins and minerals to your bunny's diet. Developed by breeders to make meat rabbits grow quickly, house rabbits should be getting most of their nutrition from fresh food. No more than a quarter-cup per five pounds of rabbit should be given each day. Again, we pay about a buck a pound for pellets, which is a very good price. The last two should be given in moderation, because just like with people, they cause gas. Unlike people, rabbits have no gag or vomit reflex and burping is uncommon. Excess gas passes through the other end, and too much can be uncomfortable for the bunny. Stay away from starches and carbs. Your rabbit doesn't need them and it's not good for them. Anything else, including carrots, should be considered treats and given sparingly. Rabbits have a big sweet-tooth. The reason that carrots are on list list is because carrots turn into sugar quickly when eaten, so it's just like eating candy to a rabbit. There is one other thing that rabbits eat, called cecotropes. Because rabbits eat so much plant fiber, they have a special pouch in their digestive system where the toughest material goes through extra processing. It is then passed through the system and excreted as soft oblong pellets. The rabbit knows when cecotropes are being excreted and immediately eats them again. This extra pass through the digestive system allows his body to get the maximum amount of nutrition from what he eats. You'll almost never see cecotropes, because the bunny eats them right away. Regular rabbit poop is shaped like small, hard balls. So there you go. Unlimited fresh water. Unlimited fresh timothy hay. Fresh veggies and the occasional treat, and your rabbit will be loving life. Any questions? Please leave them in the comments. Next time, I'll show you how to build a quick and easy cage for your house rabbits. In that same vein, Popular Mechanics has listed 25 skills that every man (and in my opinion every woman) should be able to do. I can do all except CPR and clean a bolt-action rifle. The October issue tells you how to do each one - should you not know. Personally, I think that Heinlein's list is more comprehensive (with some of JenLars's corrections. This time around, I'll talk a little bit about how rabbits behave and how you can read some of their body language. Part 1 of "Keeping Rabbits" is here. This is going to sound obvious, but rabbits are not cats and dogs. Cats are natural predators and dogs are natural scavengers, but rabbits are natural prey. Rabbits react completely differently to the world than the two animals that we're most familiar with because almost everything else in the world considers it food. When a rabbit appears sick, it's a certainty that it's vet time, because rabbits will instinctively hide physical problems as long as possible. They know that the weakest ones get preyed on first. Reaching down to pet a bunny can really stress the little beastie because to him, your hand is swooping down from above like an owl or hawk. This is especially true before your rabbit gets used to you. Building trust with your house rabbit can be a long process, and trust is what it's all about. Get down on the floor and let him (or her, I'll just be using "him" from now on) run around and check things out. They like to feel protected, so don't be surprised if they find a spot behind something or under a piece of furniture and make it their home base. Eventually your rabbit will come around to see what you're doing. Do this regularly and over time he'll get to where he will climb up on you, or snuggle in for petting. He wasn't too sure about the dogs at first, which was driving Trix crazy. Trix loves the rabbits even though they don't act like dogs, I believe that he thinks they're retarded puppies. Because Ozzie was so skittish, tonight was the first night that they've been in close contact. We expanded the pen so there was some running -around room, then Trix and I went in and lay down and waited quietly. Before long Ozzie came up to us to check things out, and he and Trix sniffed each other a bit. Trix mostly stayed on his belly, dragging himself around by his front legs so that he was on the same level as Ozzie. I've never seen anything like it. Within an hour Trix and Ozzie were laying side by side on the floor, just chillin'. Watch your rabbit while he's exploring! Rabbits, especially younger ones, will chew things! Bunny-proof your room by wrapping cords in conduit or putting them up out of reach. In my wife's sewing room (where the bunnies live), we put cardboard in front of the walls to hide the cords. If a piece gets chewed on, we replace it. Keep a squirt bottle of water handy and don't be afraid to give the bunny a spritz to let him know that he's not to be chewing on something. A rabbit will almost immediately stop to groom and wash their face after you spray them. "No!" in a firm voice helps too, they'll learn. So will a thump. Rabbits "thump" when they're unhappy with a situation. They'll stamp on the ground with a back leg to let you know that they disapprove of what just happened. Thump at them and they'll know that what they were doing is a no-no. Give your bunny things to do and play with so he won't get bored and gnaw on your furniture or electrical cords. They'll chew on and throw around tubes from toilet paper and paper towels. Wicker is a favorite chew toy, just make sure that it's unfinished so they're not chewing paint or chemical stains. Put small boxes around and your rabbit will jump up on top of them or push them around from place to place. If one end is open, he'll crawl inside and explore. Those heavy-cardboard concrete form tubes you can get at the hardware store are loved! Cut it down to a two-foot section and watch your bunny spend a long happy time just running back and forth through it. You may see your rabbit "chinning" things. Bunnies have a scent gland under their chin that they rub on stuff to mark it as theirs. Toys, furniture, you, eventually they'll chin most everything in sight. It's hilarious to watch ours run around and re-chin everything that the others did while they were out last. You can almost see the little thought balloons over their heads, "*this* is mine... so is *this*... *this* is too... and *this*..."
Rabbits, especially young males, will sometimes pee to mark territory. Get 'em fixed to solve that problem. It's easy to tell when a rabbit feels happy and content. When a rabbit is tense, he'll be hunched up like a volkswagon and his eyes will be wide. If he's sprawled out on his belly or side, he feels safe enough to let his guard down a bit. You may see your rabbit do a little side-kick with his back legs as he hops around. This means he's feeling really good and having fun! Got questions? Ask in the comments, and I'll get to them. Coming up soon is how to put together a simple and inexpensive cage and what to feed your rabbit. And if you're looking for a rabbit of your own, check out your local rabbit rescue organization. 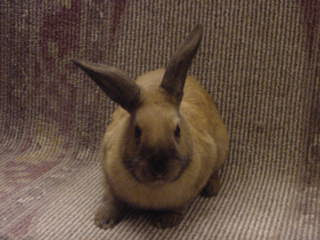 Bunny Lu Adoptions is the one we use here in Northern Virginia. You can follow that link, then click on the "Petfinder" link in the middle of their page, then scroll down and on the left you'll see a rescue organization finder to help you locate pet people in your area. We love animals. We have two dogs and three house rabbits. Most everyone knows how to care for a dog or a cat (or thinks they do), but rabbits are probably a bit of a mystery. I know they were to us a couple of years ago, before we started keeping them as pets. Our dogs and rabbits get along fine, and even take cues from each other. If the rabbits are getting a treat (raisins), then the dogs figure that they should get a biscuit too. That works in reverse too, in that the bunnies will come looking for a goody when they hear the lid of the doggy treat jar lifted. I’m going to do a series of these posts, going over different aspects about keeping house rabbits. Some of what you’re going to hear may surprise you. Some of what you’ll need to know I can’t tell you, because we haven’t had to deal with it yet (such as medical issues, our bunnies have been completely healthy so far). In case you didn’t know, rabbits aren’t rodents. They are related, but there are many important differences, the most obvious one being that rodents can and will eat meat, whereas rabbits are strictly herbivores. I’ll go into feeding and what rabbits eat in the near future. Rabbits will live up to about twelve years. You may also not know that rabbits can be trained to use a litterbox. All of ours were trained at a young age and are very good about using them. Now, I’ll introduce you to our rabbits, and tell you a little about each of them. Then I’ll recommend a couple of good books and online resources to learn more about them. This is Fred, our first rabbit. He’s about three years old and weighs 4 pounds (he’s a little guy). Fred was rescued from near the Severn River and originally named Severn. The people that found him knew he wasn’t a wild rabbit because of his ears. Rabbits with ears that point down like that are called “Lops” and they don’t happen in the wild. A lop is aways a domesticated rabbit. Fred probably was abandoned by someone who didn’t want him anymore, and he probably would not have lived through his first winter if he hadn’t have been rescued. At the bunny shelter, they renamed him Fast Freddie because of his pinball-like speed and ability to change direction instantly. When we adopted him, we shortened it to just Fred. After we had Fred for a while, we thought it would be nice to get him a girlfriend. Rabbits pair for life, so choosing a companion isn’t always an easy thing. At the bunny rescue, they had a young lady named Java. We brought Java home and paired her with Fred. I’ll talk about that in another post, because it can be a long and drawn out process to pair up bunnies. Java is a little larger than Fred, and she’s about a year and a half old now. She’s an escape artist! Once Fred and Java were a bonded pair and living together, we had an extra cage. We agreed to take another bunny for foster care from the rescue shelter. Our first foster bunny was Ozzie. 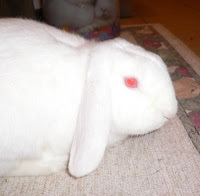 He’s an albino, and another lop, and goes through life as if he’s had way too much caffeine! He startles easily, but is also the most affectionate of our three. Yes, we did wind up falling in love with Ozzie and adopted him for our own. At some point we may get him a girlfriend as well, but the rescue had tried before and his personality makes it difficult to match him with a partner. Each of our rabbits has been fixed to prevent little baby bunnies. They’ve also been microchipped, so that if we get separated for whatever reason (for instance, during a natural disaster), we can find them again afterwards if they are brought to an emergency pet shelter. As for recommended books, there is one that stands above the rest, called “The House Rabbit Handbook”. Your local rabbit rescue will probably have copies that you can buy, or check your library. “Rabbits for Dummies” is also pretty good. Like anything else regarding pets, do your research beforehand and learn what you can before you jump into it. I really, really recommend contacting a local rabbit rescue if you want your own bunny. These people are wonderful resources, full of advice and knowledge and willing to help. Visiting one will also give you a chance to see many different sizes and types of rabbits all in one place. Out local rescue is called Bunny Lu Adoptions, and your local animal shelter or pet stores can put you in touch with ones in your area. Leave a comment and let me know if there's any interest in my continuing this series. If there is, then I'll do future posts on things like: What rabbits eat. Build an easy cage. Bonding pairs. Rabbit toys and other things you'll need. Plus all kinds of other stuff as I think of it.